I’ve been getting a lot of questions on what to pack for travel, so wanted to share my “formula” for planning outfits while on the road! I’d follow the same train of thought for planning a capsule wardrobe, for those of you who’ve asked about that. 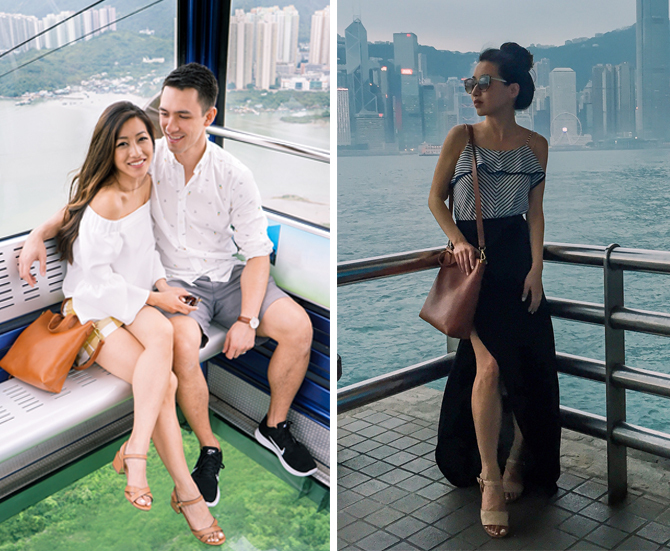 In this post I’ve shared examples of pieces that can be re-styled and stretched into outfits for over 10 days – I can fit all of the above into my carry-on with room left over, which I usually fill with extra items just in case! Packing Palette // Start by choosing a color palette for your travel outfits, including 2-3 neutrals, and if desired, 1-2 accent colors. Try to pack within this scheme, adding printed pieces in similar color families for interest. 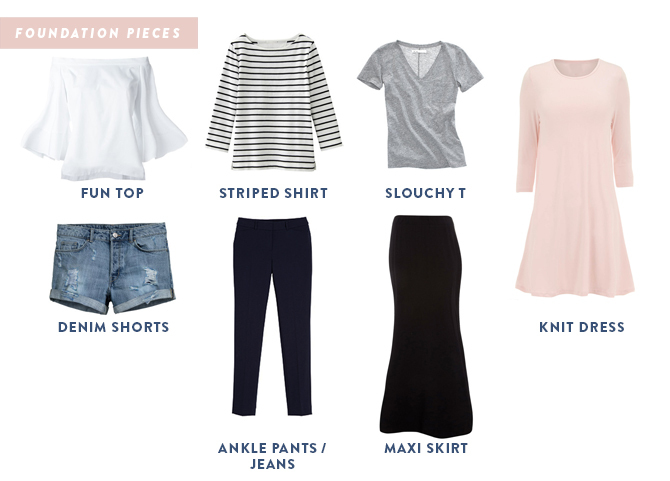 Planning and visualizing your wardrobe in categories (tops, bottoms, outer layers, shoes, bag) will make it super easy to mix-and-match the pieces…just choose one from each category to make a complete outfit! Foundation Pieces – Bottoms // I usually start with bottoms, looking for my most comfortable and wrinkle-resistant bottoms that will work for the destination climate. Dark blue and black jeans are a safe bet, as well as navy ankle pants for a dressier look (love my BR sloan pants for travel!). Maxi skirts don’t get much love on “what to pack” lists but they are my favorite. Your legs are covered up but can still breathe, plus maxi skirts can be easily dressed up or down. Mine’s from ASOS petites (I closed up the leg slit a bit with safety pins). 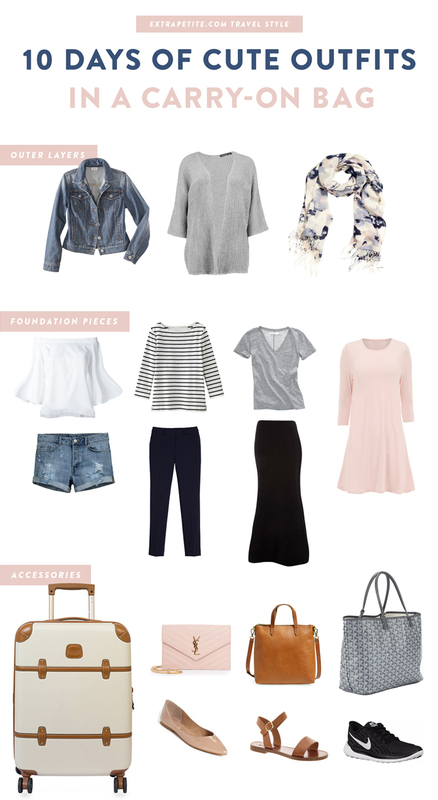 Foundation Pieces – Tops & Dresses // A slouchy tee and striped shirt are wardrobe workhorses, as you guys have seen on this blog! I also like to add a “fun” top with an interesting detail or two, that can be worn either tucked in or untucked. 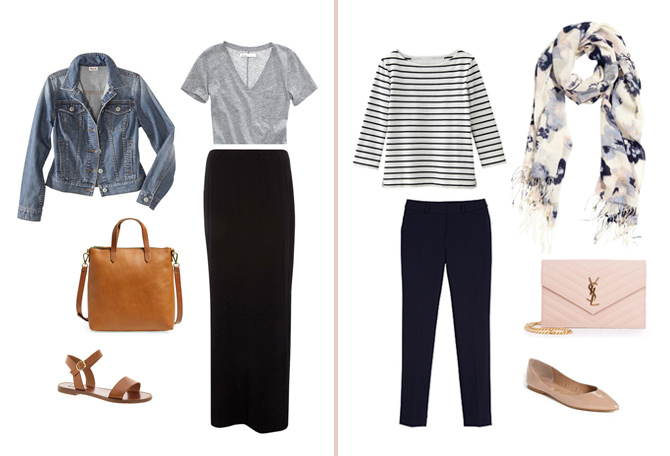 Mixing a few fashion-forward pieces in a suitcase full of basics will prevent simple outfits from feeling drab. This off-shoulder top with bell sleeves has been perfect for dressing up my basics. I’m a dress lover through and through, so I always pack a few with me personally…lace, prints, fit & flare, etc. If I had to just recommend one type for travel, it would be a stretchy knit swing dress for max comfort & versatility. Outer Layers // This will vary based on where and when you’re traveling, but you can never be too prepared for fluctuating weather. For mid-spring, I packed a denim jacket, an oversized cardigan (I cut off the tassels), and a patterned scarf that can double as a wrap. Other outer layers I love for travel include knit blazers, my moto jacket and draped trench. Accessories – Shoes // Figure out how much walking you’ll be doing on the trip, and plan shoes accordingly! Colors like cognac brown, tan, or blush are usually versatile and flattering against bare legs. I rely a lot on my Nike Free 5.0 sneakers (runs half size small) and BP blush pointy flats both pictured above – the flats I’ve mentioned are comfy for me but have no support, so size up if you want to add cushioned insoles. Accessories – Bags // Being hands-free is important when sightseeing, so you can enjoy all those ice cream cones and take hundreds of photos. I like to bring at least a roomy tote (good for the airport, shopping, beach, etc), a medium cross-body bag for general use, and a dressier clutch bag that’s also convertible with a strap. Here’s some examples of these pieces mixed & matched to create several outfits! Most of them are very practical for sightseeing, but I’ve noted a few for certain scenarios. As another tip, if I have time while packing, I’ll roughly lay out the possible outfit pairings and take a quick photo on my phone of each set. That way while on the road, I can just wake up and look through the “catalogue” of outfits on my phone and quickly choose one best suited for the day’s activities. 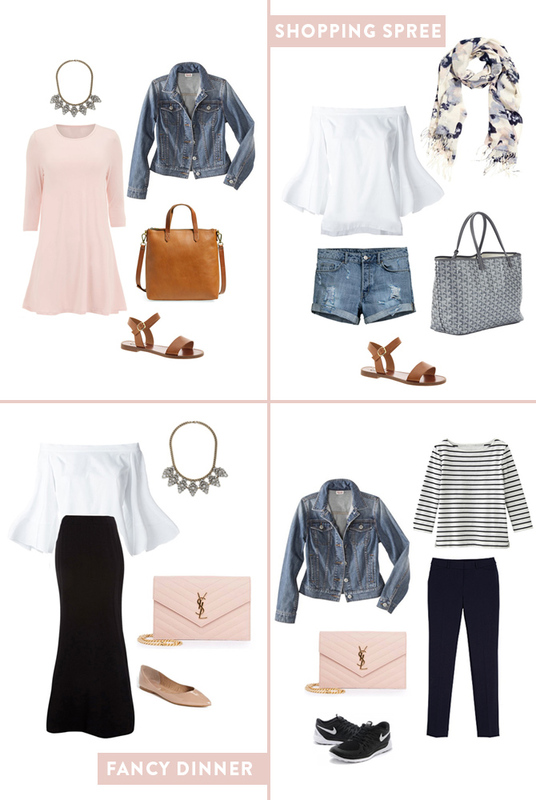 Below are two of my favorite pairings…giving me some outfit ideas for the rest of this week! Whew…I hope you guys enjoyed this post! How do you approach packing for long trips? What are some of your must-bring clothing, shoes or accessories? Incredible! e always want to carry with us tons of clothes, but some basic pieces resoolve always the situation! I love the way he looks at you! Thank you for the great tips, Jean! I'm planning a big trip later this year, and this post couldn't have come at a better time. I'll be bookmarking this post for sure! Can you tell us where you got the sandals? I've been looking for a pair just like that! Thanks!! Thanks for your packing tips! Just what I needed for an upcoming trip! This is a great guide! Love the versatility between pieces! I love this palette for spring and summer travel. I want to do something similar for all of my upcoming work trips! Where is the scarf from (in today's post, not your travel outfit from a prior post)? I just recently discovered your blog and I love it. I was wondering for this post it looks like you used a closet app? Or did you have to manually remove the background for clothes? I love how your outfits are laid out and I'm hoping to get a closet app to be able to do something similar for my own closet. I was wondering if you had a closet app or know of one to recommend for an Android phone? So perfect! I'm doing a two week Philippines/Japan/Taiwan trip in November and hoping to just bring a carry on. This post is super helpful! Hi Jean! I am in need of a piece of carry-on luggage and I am torn between the Bric's and the DVF. Since you own both, do you think it's worth spending more money on the Bric's? Thanks! Thank you! I am going on a trip and want to stick to a carry on but I can't decide what outfits to bring-I'm totally copying your list! Saw some that are almost exactly the same at Nordstrom. Super helpful! Thanks for the time and effort you put into all your posts! Off-the-shoulder tops and stripes are always my go-to, when in doubt of what to wear, I always go to them. i just ordered a suitcase like that and i can't wait to take it for a spin! i love all of these picks! What app/software do you use to put the outfits together? I too would like to know where the scarf is from please. You are so thorough! Oh my goodness, no wonder why you always look so put-together. Super duper inspiring, Jean!! Great post, thanks for all the effort and details. great post! try sam edelman trina sandals (courtesy of katherine, featherfactor.com). for the tote, i carry an ultralight canvas tote from strand books, w/local nyc cache. as for the plane, i tend to wear my workout outfit – zella layered tank w/built in bra, zella live-in capris, running shoes, and grey jcrew long sleeve perfect t – both bc it's comfy, but also bc all the layers shoes take so much space. i haven't worked up the courage to invest in YSL, but so far the tory burch wallet-on-chain has been working wonders. if you're going to a beach, i can't recommend reef ginger sandals, b/c they're comfy and easy to stuff into a suitcase/tote. I find strapless bras either impossible to breathe in +/- requiring undignified mid-stroll upward yanks. Any recommendations on bras so I can add off-the-shoulder to my collection? I'm also asking where the scarf is from? It's so pretty! I love all these pieces. Amazing post. Where can I find the striped shirt and the scarf? Love this post, hope you do more packing posts since I struggle to pack light! I'm sorry to tell you that the Baublebar codes only work on select pieces. It won't apply to any/all of them on the site. I've tried it. Hi – they are Steve Madden sandals. It's a stock image from H&M; scarf that is old, unfortunately! Hi – I did this manually in Photoshop but I believe something like Polyvore can do it more easily. Sorry I don't have any closet apps to recommend! I've asked about this a few times before and the answer in general is that pricing is based on demand – basically how much inventory is selling and how much is left. So my guess of an example is if an item is selling really well in petites then they may price it higher, whereas if it's not moving in regular sizing then it may be included in sales. The amount of fabric between regular and petite really does not get factored in to pricing. You get what you pay for … the DVF is stylish but it's very inexpensive for a suitcase (when on sale) and feels that way. The Bric's I feel is a high quality suitcase made by a luggage company, so I'd recommend that one if price is not an issue. It's very thin, which is not surprising given the price point. Maybe in direct sunlight you'll be able to see the silhouette of legs a bit through it. It's black though so I don't really have issues with seeing details through the fabric!